Personalise your own Huawei Ascend P8 hard case. Be creative and upload your favourite photo or unique design. With this hard case you can ensure style and protection for your phone. 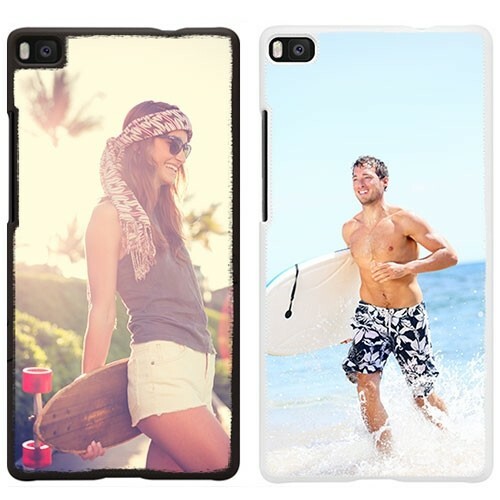 Create your own Huawei Ascend P8 case! Finding a phone case the really suits you is harder than one might think. There are very few places you can find a phone case the connects well with your style and taste. GoCustomized has made it easy but allowing you to design the case all by yourself. Using any of your favourite photos, images, patterns or pre-made designs, you can make the perfect personalised Huawei P8 case. There are two case colours to choose from for your hard case, black or white. All our cases are made of a hard, durable plastic which ensure your phone is well protected from scratches and dents. What are you waiting for? How can I make my own case? Not everyone has the skill set to design a personalised case all by themselves. GoCustomized has developed an easy to use, user-friendly design module which will help you each step of the way. Start off be selecting the base colour you wish to have for your case. The base colour will remain visible on the sides of the phone case. Secondly, upload one of your favourite images. You can do upload image files straight from your PC, Tablet or Smartphone. You can also use your Facebook and Instagram accounts. Ensure that the image you use of the best possible quality. The better the quality of the image used, the better the end result. Add a little personal text as finishing touch and you are good to go!